(TNS)—Sometimes, you just want to get away. You crave a little personal space—a place you can relax, work, get creative and make a mess without guilt. The best refuge might be waiting in your backyard. That special room may be a she shed. A distinctly female counterpoint to macho man caves, she sheds are springing up worldwide. “There are many in California, but I also found them in Australia, the United Kingdom, all over,” says author Erica Kotit e, a home and lifestyle expert. Kotite spent almost a year studying the phenomenon—as well as building a she shed for her sister—for her new book She Sheds: A Room of Your Own. “Women see them and…you can almost see the mental calculations they’re making as they imagine where they could put one in their yard,” Kotite says. Instead of storage, sheds become dedicated to something of particular interest to the woman of the house, she says. For example, Sonoma jewelry and clothing maker Anne Freund needed space to work on her jewelry and sew. By adding electricity and lighting, she turned a small wooden tool shed into her private studio. A she shed can give creative women room to work, Kotite notes. Her she shed makes for less mess in the house. “My husband appreciates it. My creative space used to be the dining room table. It was always messy and overflow. I had to push things aside to eat dinner. Now my mess stays in my she shed. When friends come over, I don’t have to rush around to clean up. Most pre-fab sheds often are short and dark, with six-foot ceilings and without windows. 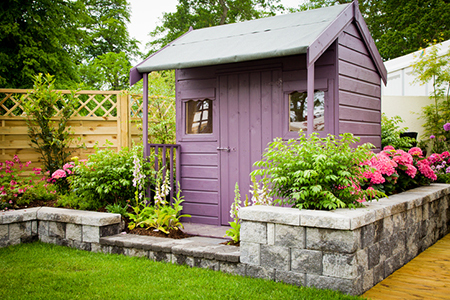 Sheds can be cold and drafty, needing insulation to keep them comfortable year-round. Other creature comforts—electricity, lighting, Wi-Fi access—make the shed more usable, but also more expensive. Such upgrades may also need building permits or other approvals. The least common upgrade, Kotite finds, is indoor plumbing. “Then, it starts to become a mini-house,” she says.